Come see the Swagelok Custom Solution fabrication capabilities, hose cell, component cutaways, training rooms, warehouse and onsite inventory, as well as have the opportunity to speak with our in-house engineers, technical product experts and technician team. We’ll plan to discuss both recent project highlights and applications of emphasis such as grab sampling and instrument enclosures. 11:45 – 12:30 Swagelok Presentation and Shop Floor Stroll with some project demonstrations and product cutaways. Cost: $16.00 plus processing fee of approximately $1.15 / ticket. 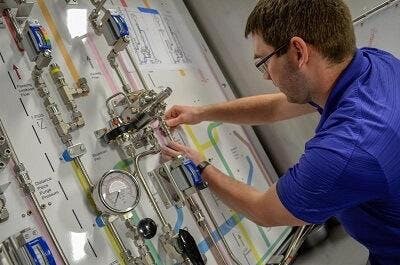 With Swagelok® Custom Solutions, it’s never too early to consult with our fluid system experts. We provide the support you need, regardless of a project’s size or complexity.